Over the years we have delivered a programme of ongoing investment across all areas of the business and are committed to continuing with our investment plans as the business goes forward. Our key strength lies in the depth of knowledge, skill and experience of our staff. We have a highly qualified, experienced and skilled workforce with specialist skills in acoustic design, mechanical design (2D AutoCad and 3D Solidworks) , project management and site and installation management. We also provide specialist skills within structural design, fire and gas detection systems, electrical fit out and blast load analysis as an integrated offering within our range. Within our manufacturing team we employ highly skilled and experienced metal workers and fabricators and have a highly trained and experienced installation team. We continuously invest in the latest sheet metal and fabrication tooling and equipment. In 2015 we consolidated our two West Yorkshire manufacturing facilities and relocated to a new modern purpose designed 42,000sq ft manufacturing facility in Heckmondwike, West Yorkshire which supports our requirement for additional capacity, floor space and height as our customer base and product range grows. 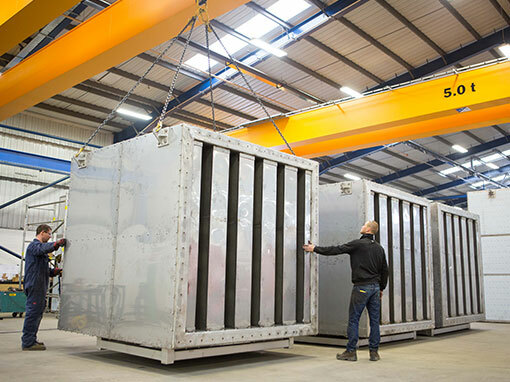 With significant overhead crane facilities (3 x overhead crane (10T,5T,3T) – 6.3m hoist) we can cater for products of significant size and weight. We operate within the principles of lean manufacturing and are committed to a programme of continuous improvement throughout all areas of the business. We operate a fully integrated QHSE system and are accredited to IS09001:2008, IS014001:2015 and OHSAS18001:2007 as well as Achilles Building Confidence, UVDB and Safecontractor.